Siamese cats have always captivated both cat and animal lovers. Their exotic look, their unique coloration, their striking blue eyes, the sleekness of their bodies, and their singular personality make these oriental cats particularly attractive. It is no wonder that the Siamese breed is one of the most popular these days. So where did the first Siamese cat originated? The exact origins are not conclusively known. Experts believe that the breed originated in South East Asia. Whatever its origins, the Siamese was first exported to Europe from Siam (now modern Thailand), hence the name of the breed. It is believed that the ancestors to the modern Siamese were considered sacred and were kept at temples. The first Siamese made it to England in the late 1800s. These cats were a gift from Siam to an English ambassador who later brought them to England. In 1885, Siamese were shown at the Crystal Palace Show in London. Later on, during the early part of the twentieth century, Siamese began to be shown at American cat shows. Interestingly enough, the modern Siamese cat does not look exactly like the original (or traditional) Siamese. During the 1950s and 1960s, many cat show judges and breeders started favoring the elongated bodies, narrow head, and wide-set ears of the newer Siamese over the more athletic, round-head look of the original Siamese. Thus, the modern Siamese was born. You can still find "Old Style" or "Traditional" Siamese. But the modern Siamese seems to be the most popular (and better-known) of both styles. Siamese are easily recognized by their intense blue eyes, their unique coloring and by their singular body shape. Indeed, the Siamese are well-known for their distinct coat, which is a study in contrast: Head and/or face, tip of the tail and paws dark and the rest of the body a light cream. This pattern is the result of what is known as "partial albinism", which refers to the mutation in an enzyme that affects melanin production. Melanin is involved with the coloring of skin and fur. This enzyme is heat sensitive, thus the coolest parts of the body become darker and the hottest become lighter. Interestingly, at birth, most Siamese kittens are light cream or white all over. The Siamese cat has a pointed pattern. Pointed cats have dark points in their face, tail and paws. These points become lighter throughout the rest of their bodies. However, not all pointed cats are Siamese. Other cat types and breeds produce pointed variations. The Seal Point pattern consists of dark brown to almost black points in the face, tail and paws, and light fur (usually dark cream or ivory, or light brown) throughout the rest of the body. This was the first color variety of the Siamese cat and it’s also the best known. The Chocolate Point Siamese cat has a chocolate brown face, tail and paws, while the rest of the body is a light brown. The Blue Point pattern shows bluish-gray points (head, legs and tail) combined with beige or pale gray body. The Lilac Point has light pink-gray points with a white body. Other Siamese-style patterns include the lynx point, which has tabby points and comes in different color variations as well, and the tortie point, which has tortoiseshell points. In my opinion, the lynx point Siamese and the snowshoe Siamese (which seems as if it's wearing white booties) are very striking cats. In the United States, Oriental (Siamese-style) cats with these patterns are classified under the Colorpoint Shorthair breed. In the United Kingdom all pointed Siamese-style cats are recognized as Siamese. Because Siamese have blue eyes, they might suffer from hearing problems, however, most Siamese are not deaf. Besides the different color varieties of the Siamese, there are also two main "types" of this beautiful breed: the Modern Siamese (which I discussed here) and the Traditional Siamese. 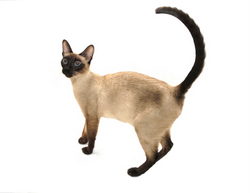 The old-style or traditional Siamese has a rounder head than the better-known modern Siamese. Why the two different types? Apparently, over the years, cat show judges and breeders became fond of the elongated modern Siamese with its wedge-shaped head and pointy ears. Eventually, this type became the norm at cat shows and exhibitions, and in many instances the only accepted Siamese breed. However, many breeders still keep reproducing the old style, also known as the traditional, Siamese breed. Siamese make excellent pets. They are easy-going, affectionate, loyal, and very social. Siamese are also very vocal (see the video below). These felines enjoy human companionship and many in fact believe that Siamese are very dependent of their human family. However, like most cats, they don’t like change or sudden alterations to their environment. So if you are looking to adopt a cat, consider the Siamese. --Koko & Yum-Yum - from Lillian Jackson Braun's "The Cat Who..." series of mystery -books. --Shan Shein, the cat of former US president Gerald Ford’s daughter Susan. My ears are too beeg for my head. My head ees too beeg for my body. I am not a Siamese cat ... I AM A CHIHUAHUA! ~ Skippyjon Jones, doing his best Spanish accent. --Plush Siamese make cuddly gifts for Siamese lovers of all ages. --A poster or art print portraying this beautiful oriental breed will beautify any spot of the gift recipient. --A calendar featuring Siamese felines makes an inexpensive (and useful) cat lover gift.